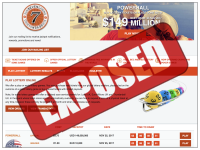 Is Sun7Lottery a Scam or Legit? Read Reviews! Sun7Lottery Exposed — Make Sure You Read the Small Print First! I’m still seesawing between betting on official lotteries and getting real tickets. I found a site that gave me both. Sun7Lottery.com offers 17 lottery games for betting and getting real tickets. Well, that’s what I thought. Then I started to dig deeper and ended up with more questions. Let me explain. Sun7Lottery.com offers players 17 lottery games online. These include the usual US Powerball & Mega Millions, EuroJackpot and UK Lotto. I’m not sure why, but they also offer Euro Millions Belgium, Ireland and UK not to be confused with EuroMillions Australia which is a totally different game. What else is different is they offer players three ways to play – the official lottery game, insured and betting. It looks like playing the official game means the usual prize tier except there is nowhere on their site that explains this. There are no terms and conditions that set out what you win. The same goes for the “insure” option, though the jackpot noted, is significantly less than the jackpot for the official. At the same time, the cost of the ticket is less. Weirdest, the “betting” option is shown as no cost though still with a jackpot listed and they refer to it as a multiplier game. Sun7Lottery.com doesn’t seem to have anywhere that they actually explain the prize tiers for any of the three options on all their lottery games. There are no terms and conditions. Click on help and you’re taken to a “knowledge base” at gamblingtec.com which sure doesn’t know a lot. The only way it seems to be able to get more information is to register – and you’re not registering with Sun7Lottery.com but with gamblingtec.com. Bouncing around links, we finally found under gamblingtec.com the fact that lottery tickets are paid out 99% to the player and 1% to SSNV (aka Sun7Lottery.com). Prizes can be collected by either party less any taxes and costs. Okay, in their gambling terms and conditions there is another clarification that lottery tickets are paid out when they have received the money from their insurance agents. I’m not sure if this means they actually buy lottery tickets or not for the official draws. I’m also getting a little annoyed at how hard it is to find information. Reading through Sun7Lottery.com’s explanation on lottery ticket scans simply got me more confused. They talk about automatic “digitised scans” available for some of their lotteries, but say these are not physical tickets. They do say that they do purchase real tickets for some of their games, but this was buried in gamblingtec.com’s terms. It is clear that for some of their games they use a “risk company” which usually means tickets are not actually purchased. So, some of their lottery games are betting/gambling on the results versus actually buying tickets. That is the other thing that is offered through Sun7Lottery.com and their alternative ego gamblingtec.com – casino games including slots, roulette and blackjack. Players are offered the choice to either “real play” or “fun play” though in either case you have to register first. There doesn’t seem to be any information on any limitations on who can play here. The only reference was a comment about the fact internet gambling may be illegal where you live so they can only accept ‘alternative currencies’ like BitCoin. Sun7Lottery.com is owned by Sunseven NV out of Curaçao. It seems they use gamblingtec.com software for players to play lotteries. There is an email address and a bunch of social media links, but no snail mail address or phone numbers. It makes it very frustrating when the questions keep adding up. Would you mind rating Sun7Lottery.com? I’m still getting my head around the frustration of trying to find out more about how SSNV operates and what I will actually win. It’s not clear whether they actually buy lottery tickets in their “official lottery games” or simply use the results and insure against a player winning one of those mega jackpots. I did ask the question to them but still haven’t received an answer. This site gets a thumb’s down. When I am going to share my personal and credit card details, I want to be clear on who I’m dealing with and what I’m going to win.